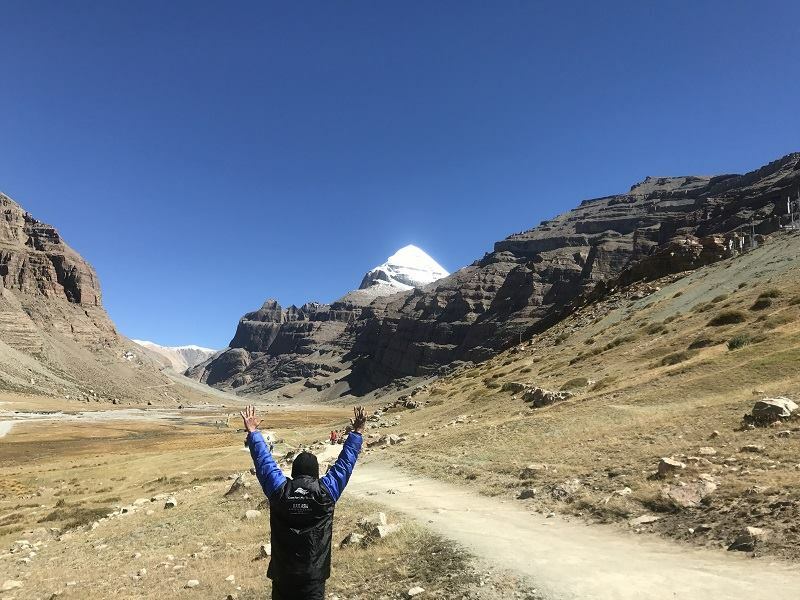 Imagine completing your Kailash Mansarovar Yatra by Road 2019 in just 14 days – without any physical hardship and in the swiftest possible manner. It’s possible with Comfortmytravel. Kailash Mansarovar Yatra is considered the pinnacle of religious destinations for Hindu Pilgrims. The journey is a bit difficult but our highly experienced Comfort My Travel guides make traveling a breeze. With the land tour and better infrastructure of roads, the journey will not leave you tired. The Mansarovar tour via road will be the best tour of your life seeing the nature at its finest is one of the main reasons to enjoy a road trip yatra. This road yatra will allow you to get off the beaten path and see actual communities and natural wonders and will be one of the most fabulous experiences of your life. This road yatra will be a lot more detailed and relaxed. The 14-day journey. The first day of our journey starts with the arrival at Tribhuvan International Airport in Kathmandu. Our representative welcomes all tourists and transferred to their respective hotels. Check in to rooms follow this. Stay at a 3-star hotel on sharing basis. Distance covered: 0 kms, Altitude: 1400m, Meals: Dinner. Day 2: A visit to Kathmandu Temple. After the breakfast at the hotel, we start on our sightseeing tour in Kathmandu wherein we visit Pashupatinath Temple and Budhanilkanth Temple, both holding religious regards to Lord Shiva and Lord Vishnu. After this, we return to our hotels for lunch. In the evening, we shall have a briefing and introduction session for all group members. Overnight stay at the hotel. Distance covered: 0 kms, Altitude: 1400m, Meals: Breakfast, Lunch, and Dinner. Day 3: A long drive from Kathmandu to Dhunche or Shyabru Besi. We leave after breakfast on a bus to Dhunche. This drive isn't long in distance but the traffic can make it tiring. Upon reaching Dhunche/Shyabru, the stay would be in a hotel or lodge. Dinner shall be served. Distance covered: 130 kms. Altitude: 3200m, Meals: Breakfast, lunch, and dinner. food material shall be loaded into the buses by the accompanying Nepalese Sherpas. On arrival to Keyrong, we check into our rooms and take rest. Hot tea or coffee shall be served with light snacks. You may walk around in the nearby markets and dinner shall be served after that. Overnight stay at a guesthouse. Distance covered: 125 kms, Altitude: 3700m, Meals: Breakfast, lunch, dinner. We rest on this day for acclimatization of climate in Tibet. Our tour manager shall guide you for a short hike in around Keyrong which will help you to adjust with the harsh climate. Distance covered: 0 kms, Altitude: 3700m, Meals: Breakfast, lunch, and dinner. Day 06: Keyrong to New Dongba via Saga. We drive through the mountains followed by plains with a splendid picturesque view of lake Pieko-Tso. We cross river Tsangpo (Brahmaputra) for the north and arrive at a settlement of Saga. As we move, the landscape changes to the beautiful high plains of Tibet. We further drive to New Dongba and stay overnight at guesthouse or lodge. Distance: 380 kms, Altitude: 4750m, Meals: Breakfast, lunch, dinner. Day 07: Dongba to Lake Mansarovar. Day 08: Lake Mansarovar to Darchen. After the breakfast and holy dip in Lake Mansarovar, we arrange Pooja and havan for you. The crew shall provide everything that you need. After finishing this, we head for lunch and then we head for Darchen, which is a major administrative hub of Kailash. You can stroll around here at markets. The stay shall be in the guesthouse. Distance covered: 40kms, Altitude: 4650m, Meals: Breakfast, lunch, and dinner. starts. The tourists not going for Parikrama can stay at the guesthouse for two nights. The journey ahead shall be carried on foot. Horses or yaks can be hired by those willing to and shall be guided by Tibetan guides on payment basis. Food shall be carried on Yaks and travellers should carry their lunch and hot drinkable water. We gradually ascend through the banks of the glacial river so that it becomes easier to reach Derapukh within 4-6 hours. The temperature at Darchen shall be below zero and all tourists shall stay at guesthouses and dinner with soup shall be served upon reaching. Altitude: 5056m, Meals: Breakfast, a packed meal for lunch and light dinner. Day 10: Trek from Derapukh to Zuthulphuk via Dolma La pass. Waking up early before dawn to catch the golden sunrise of Mount Kailash. After breakfast, we leave for Zuthulphuk, which is the toughest trek. We climb continuously for 3-4 hours and steep down to Gauri Kunda and up to a flat valley for 2.5 hours and then another 2 hours flat walk. All travellers shouldn't forget their packed lunch and hot drinkable water before starting to trek. We shall take a break after crossing Gauri Kunda for lunch. The downtown journey wouldn't be easy as it will be downhill with loose stones. Then after a flat trail, we reach Zuthulphuk. Even the travellers on horses will have to walk 2-3 hours while coming down from Dolma La. The stay at Zuthulphuk shall be at guesthouses and after dinner, you can sleep early in your warm bed. Altitude: 5650m, Distance: 22kms trek, Meals: Breakfast, packed lunch and dinner. Day 11: Trek to Darchen and drive to Dongba. This is the last day of Trek after breakfast we begin our final journey on foot to Darchen. Your transport will pick you up from Darchen. The road is accessible and upon reaching Darchen you will join other group members. We have lunch at Darchen and then head towards Dongba by completing the rest 30% of the Parikrama at Lake Mansarovar. The night stay shall be at guesthouses. Meals: Breakfast, lunch, and dinner. Distance: 08 kms Trek and 340 kms drive. We leave after breakfast to Keyrong where we pass the beautiful town of Saga. Our journey consists of the beautiful view of Brahmaputra river, Tibetan plains, Himalayas, Shishapangma and the Pieko-Tso lake. We drive on evenly pitched roads as we reach Keyrong where we stay overnight. Distance covered: 310 kms. Meals: Breakfast, lunch, and dinner. Day 13: Keyrong to Kathmandu via Rasuwagadhi. immigration control in Rasuwagadhi and get into our vehicles for the Nepalese border. Drive further to Kathmandu is followed. The drive might take 7-10 hours depending upon the traffic. Dinner and stay at Kathmandu. Distance: 270 kms. Meals: Breakfast, lunch, and dinner. Day 14: Leave Kathmandu. After breakfast, all tourists shall be transferred to the Tribhuvan International Airport in the bus to head back home. Kailash Mansarovar Yatra by Road Ex Kathmandu 2019. Tour starts from 20th April 2019. Kathmandu, Muktinath, Pashupatinath, Ayodhya, Naimisharan and Lucknow local sight was seen.